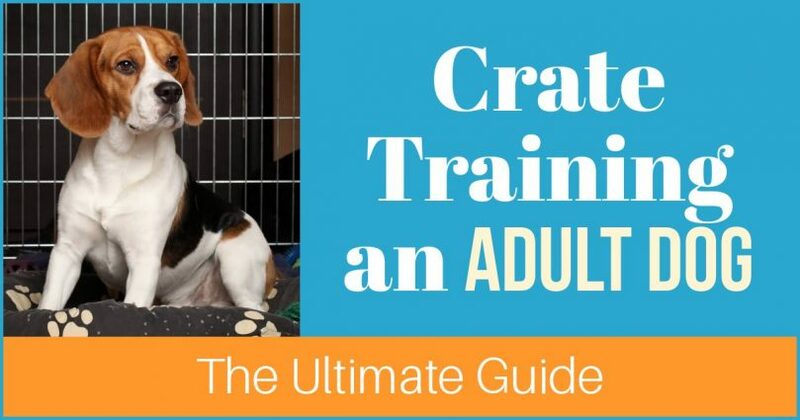 If you’re wondering how to crate train an older dog, or whether crate training an adult dog is even possible, we have good news for you! With patience and a plan, almost every dog can be taught to love his crate. Crates are widely used to house train puppies, but when you adopt a new older dog, it’s often a game of trial-and-error to find out if he’s house trained already or even whether he’ll eat your couch when you’re not home. A crate can keep him safe and out of trouble when you can’t be watching until you have determined that he’s well-behaved enough to have more freedom when alone. 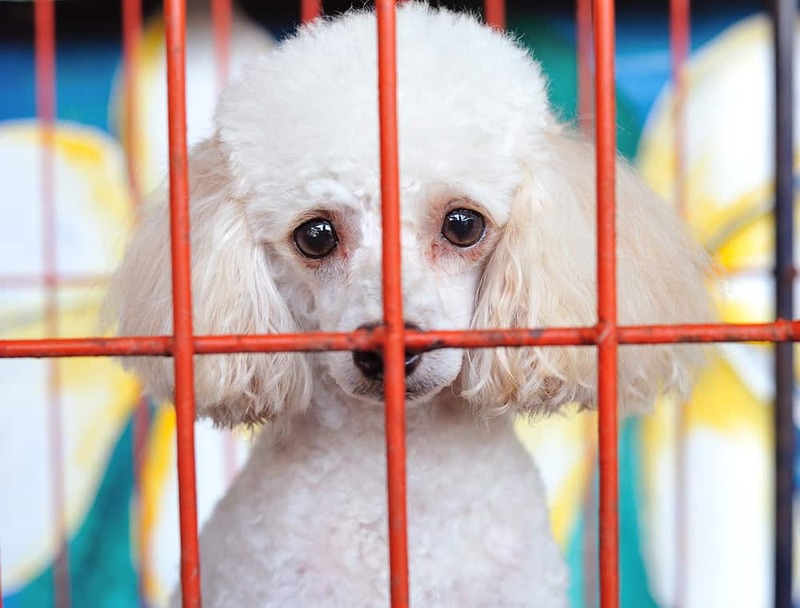 Some dogs with a mild case of separation anxiety can feel more secure in a crate, although with severe separation anxiety issues, crates can make the problem worse. See a qualified behaviorist if your dog is showing signs of frantic or extremely anxious behavior when you aren’t around. But there other reasons to crate train an older dog, even if they already have excellent house manners. Why Even Bother? My Dog Is Great in the House. What Are the Special Challenges in Crate Training an Older Dog? A crate, used wisely, is a terrific tool for house training, controlling destructive behaviors and teaching manners. But there are even more important reasons to teach your dog to be comfortable and relaxed in a crate. A crate is a safe way to travel with your dog in the car. 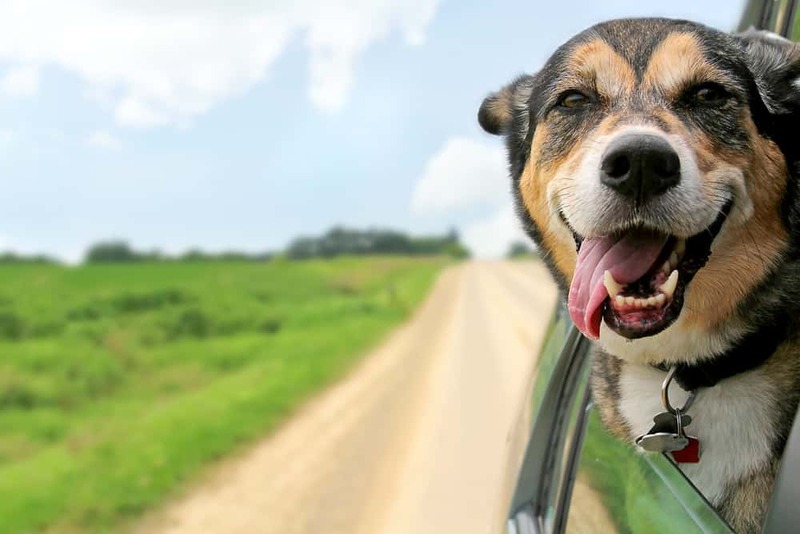 Many states have laws requiring you to restrain your dog while a car is moving so he can’t interfere with the driver. It’s also a good way to keep him safe from being thrown around when you hit the brakes. For large dogs, you might need a station wagon or larger SUV to hold the size of the crate you need, so a car crate isn’t always an option. You can hook smaller dog crates onto the seat with a seatbelt. If you need to board him, crate training may be required. Many kennels will need your adult dog to be comfortable in a crate if you want to leave them for an extended stay. Hotels and motels may insist on having your dog crated too. This requirement is a reasonable request to help keep their rooms free from damage if you leave your dog alone. While visiting friends or family, you may need to confine him safely. Parties can stress your dog out, especially an older dog, and being able to take his den with you and put it in a quiet room can help keep your dog calmer. For that matter, crating your older dog during a party at your own home is perfect if the commotion is too much for him. Air travel means an extended stay in a crate. 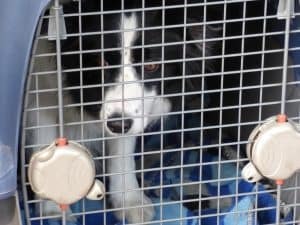 Traveling by air can’t be anything but a traumatic experience for an animal, but if he’s already learned to be comfortable in his crate, it won’t be quite as frightening. Many times a dog will have to be crated after an operation or injury, sometimes for an extended period. If he already loves being in the crate, he’ll adapt much faster, possibly shortening his recovery time. You may have noticed that the above list requires that your dog already knows how to relax and be at home in his crate. If you haven’t taken care of it before you need it, you’re too late. So let’s see about getting it done now! Since an older dog has a history, either with you or with other homes, he’s more likely to be resistant to the idea of being confined if it is new to him. He may fuss, and you might hear your dog barking and whining in the crate at night. In addition to being more set in his routine, a newly adopted adult dog can come with baggage about being crated: he may have been over-crated (almost all the time), or prior owners punished him in a crate. As a result, he may refuse to enter a crate, even for his favorite treats or toys. If you have a dog who is comfortable going in and out of the crate and you want to teach him to relax and stay inside longer, check out our basic crate training article. The process is the same for older dogs and puppies if the dog has no serious resistance to the crate. If things are a bit more challenging for your older dog, here is a step-by-step plan to help make it easier for him to accept going into the crate. Once he’s confidently going in and out, it’s time to play games and do some training to help him feel great going inside and staying there. Before we’ll jump the exact process, we need to make some preparations. To figure out the appropriate crate size for your dog, allow for him to be able to stand up and turn around comfortably. He shouldn’t have too much extra room, or you’ll lose the feeling of being in a den-like area. The good news is you don’t need to change crates as would you do with the puppy, as your dog is already reached his maximum size. A couple of toys (ones you are confident he can’t chew up or break into pieces) and some bedding will help to make it feel comfy. Don’t include food or water bowls, but be sure he gets plenty of water when he’s out of the crate. If your dog likes to rip things up, you may not be able to put soft bedding with him. Soft-sided crates are easy for an anxious dog to rip up, so we don’t recommend them for the initial training. Later this may be a good option for a dog who doesn’t chew much, especially a smaller dog. Soft crates are easy to carry with your dog inside and can fold up for compact storage. Wire crates are a decent choice, but since they are open and less den-like, they’re not our first choice for crate training an adult dog who’s having difficulties. These are not easy to carry while a dog is inside, but they do fold up into a compact package for transporting or storage. Furniture crate – is a new trend in crates, which combines an end table with a crate. If your dog is the right size for it, this kind of crate saves space and is less noticeable in your home. They could be pricey, though. Obviously, a furniture crate won’t work if you need to move it around. Hard plastic airline-approved crates are an excellent choice when struggling to get your older dog to accept crating. They have a more den-like feel that can provide more of a sense of security, and the ability to remove the top section helps with crate training dogs that have a deep-seated resistance to going inside a crate. Most of the time it’s a good idea to keep your adult dog’s crate in an area of the home where the people hang out. If he’s locked away from the social activities of the family, he may feel left out and be more likely to bark or whine in the crate. Exceptions to this are when he’s not feeling well, he’s stressed by strangers in the house, there are too many children around, or you’re hosting a party. These are situations where a quiet room can help him to relax. Take off the door or secure it open with a clip or bungee cord. Then toss some treats in and see if your dog will follow them in to get them. It’s likely he will be a little wary about going in at first, so put the treats just inside the doorway of the crate. Keep throwing treats in, a little farther back each time. Put your dog’s favorite toys (or new ones) inside and let him get them. Continue to have him going in and out for several days before moving on to Step 2. Move his bed and toys next to the crate, so he gets used to being near it. Spend more time with treats near the door if he will put some of his body inside. Only gradually move the treats back farther. Try using real meat or cheese to tempt him. Once he’s going in and out comfortably, go to Step 2. Take the top off of the crate (or use the pan if using a wire crate). Repeat the above process with treats and toys in the open crate bottom. Take as long as you need to get your dog to feel safe with it. Once he feels safe getting treats and toys, begin to feed him his meals inside the open bottom. Only when he is readily going into the open crate will you try it again with the top on. At this point, go back to the beginning with treats and toys. Keep in mind that this step might take several days, even weeks, depending on your dog and his history with crates. Be patient – if you rush this step, you risk undoing any good feelings he has developed along the way. Feed him his meals inside his crate. Play Crate Manners Games (see below for instructions). Give him all of his treats and toys in the crate to help him associate the crate with all of the things he likes best. Once he seems quite comfortable eating his meals in the crate and playing the Crate Manners Games, you can move on to Step 3. While he’s eating, close the door for a few seconds. Hand him a yummy treat or piece of real meat or cheese through the wires. Open the door (stay at the crate). Repeat this process during meals for a day or two. Close the crate door while he’s eating a treat inside and walk away for a couple of seconds. Quickly return, give him a treat through the bars, and walk away again for a couple of seconds. Quickly return and let him out (see Crate Manners Games below for teaching him to come out politely). Repeat these steps several times a day. Gradually begin to increase the time you are closing him in. NOTE: If he starts barking or crying, don’t let him out. Wait for at least a tiny break in the noise before opening the door. Ignore him and treat him as if he’s invisible – he needs to understand that this strategy simply will not work. If you even look at him or talk to him, he’s getting some attention, so IGNORE HIM! Be sure to check out our basic crate training article for some other suggestions. Crate Manners Games combine the benefits of making being in the crate rewarding with teaching a command to get your dog to go in and out when you tell him! And it’s a lot of fun for both of you. This process works to crate train both adult dogs and puppies. Toss a treat into the back of the crate, saying a cue like “Kennel Up!” or “Crate!” in a happy voice. While he’s eating the treat (before he comes out), throw another into the back of the crate. Repeat the above step until he’s staying inside, waiting for you to throw another treat. After a few times of this, say “Okay!” and encourage him to come out. Repeat the entire process for several treats. Make this a fun game, and he should soon run back in to do it again! Note: if he doesn’t chase the first treat into the crate, you are trying this too soon. Go back to the steps on getting your dog to go into the crate comfortably before trying again. Send your dog into the crate with your new command. If he isn’t going in on command yet, keep playing Part 1 until he does. Toss in the treat AFTER he goes in on command, and close the door while he’s eating. Quickly toss another treat to him through the door. Repeat this a few times, but stay near the crate – don’t walk away yet. After you’ve done this a few times, if he’s sitting, open the gate saying “Okay!” and let him out. Play the same way as Part 2; only this time step a bit away from the crate in between treats. Play Part 3, but when you come back to open the door, wait for him to sit (or lie down) inside the crate. You don’t need to ask him, just wait. When he sits, put your hand on the latch. If he gets up, take your hand away. If not, start to open the door. If he gets up now, close it and take your hand away. Always wait for him to sit back down before starting the process over. When you get to the point where you can open the crate door just a bit and he doesn’t get up, say “Okay!” and open the door all the way to let him out. Gradually open the door farther before releasing him with the “Okay!”. If he gets up when you are opening the door, quickly close it again. Your dog is all about efficiency. When he realizes he gets out faster when he sits than when he tries to push out, he will start cooperating happily. Bonus tip: you can use this same process to teach your older dog not to bolt out the front door – just be sure he’s on the leash when working on it just in case he gets out when you’re not ready. Safety first! And here’s a great video showing the process of teaching your dog to be calm going in and out of the crate. Not taking the time to let the dog get comfortable in and around his crate: your dog will let you know when he’s ready to move on in the process by how happy he looks. Pushing him into the crate: doing this will set you back and make him afraid of being put in. Unless you have absolutely no alternative, don’t push him in. Using the crate as a punishment: if you’re angry when you send him into it, he’ll become afraid of the crate, the opposite of what you want. Your emotional vibe should be happy or, at the very least, neutral when crating him. 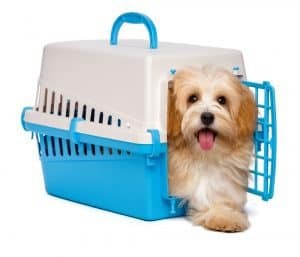 Crating for too long: never crate a dog more than four hours without a break for potty, exercise, water, and companionship, and even shorter for a puppy or an elderly dog. Letting him out when he’s barking or whining: he has to learn that making noise or being obnoxious doesn’t work, but being quiet can work. Don’t look or talk to him if he’s fussing. And while a crate makes a great “time-out” place for an adult dog or puppy, if you haven’t gone through the process of making it a safe and comfortable spot, it’s punishment even if you don’t yell at him. A “time-out” is for calming down an over-excited dog, or carefully teaching him that his behavior isn’t acceptable if he wants to be with you, but you can quickly undo any good work you’ve done by misusing the crate. By following these steps, you will see your older dog gradually getting more comfortable with the idea of being confined in a crate. Take it slowly and move at his pace – you’ll be able to see by observing his body language how he’s doing. Be sure to use the crate correctly. Keeping your dog locked in a crate for most of the day and all night will create a whole new set of problems for you. It’s not reasonable to confine an intelligent, social, active animal in that way. If you must crate him all day, you should hire someone to come in at least once every 3 or 4 hours. A potty break and much-needed exercise and companionship will go a long way toward keeping your dog happy and healthy. And be sure to give your dog plenty of attention when you are home!